This product was added to our database on Wednesday 19 May 2010. Aimed squarely at the enthusiast, modeller and historian, Southern Cross Mustangs is without question the most thorough examination that has as yet been made of the history, technology, camouflage and markings of the Australian and New Zealand Mustangs. Southern Cross Mustangs is divided into 17 chapters covering different aspects of the story. BACKGROUND - provides brief overview of the type and its service. MODELS & VARIANTS - examines the differences between and modifications made to the NAA built Mk III (P-51 B/C), Mk IV and IVA (P-51D and K) and the CAC built CA-17 Mk 20 and CA-18 Mk21, Mk 22 and Mk 23. OVERALL SCHEMES - looks at the colours and finishes of the military and civilian liveries. NATIONAL INSIGNIA - charts the evolution of The RAAF and RNZAF insignia. SQUADRON CODES - identifies the style, size and placement of code letters for each unit. SERIALS - explores the background, fonts and placement of the aircraft’s serials. SECONDARY MARKINGS - illustrates the stenciling for each variant and service. OTHER UNIT MARKINGS - describes the designs, logos and badges used by each unit. SPINNER COLOURS - looks at the designs used on spinners in service. PERSONAL MARKINGS - covers nose art, rank pennants and non-regulation markings. INTERNAL FINISHES - describes finishes in the cockpits, wheel wells, engine and gun bays. SHIPPING AND HANDLING - examines the protection methods used before and after delivery. 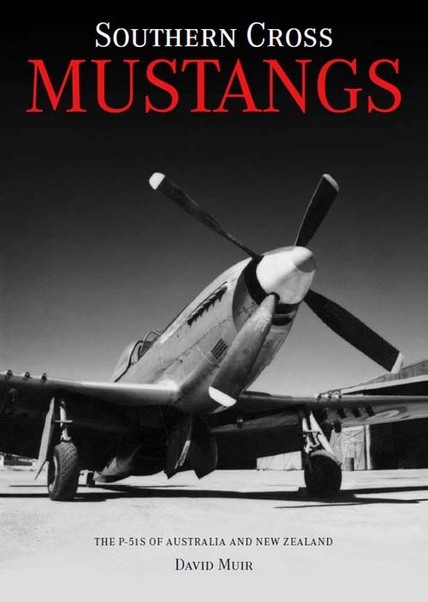 THINGS UNDER WINGS - examines and illustrates all the stores, weapons and equipment hung off the Mustangs in service including US bombs, rockets, fuel tanks, napalm tanks, smoke generators and cine camera tanks; British bombs, smoke generators, CLE and Storepedo containers and rockets and the Australian developed fuel tanks, DDT spray rig, Geletrol rockets and bombs, baggage tanks, fire extinguishing bombs, defoliant tanks, cable layer, target towing equipment, high speed releases for bombs, light series bomb carrier and test/trials equipment. PROFILES - includes 600 profiles in four chapters covering the RAAF Squadrons in the MTO, NAA and CAC built aircraft in Australia, the Pacific, Japan and Korea, the RNZAF aircraft and the civilian operated aircraft of both countries.